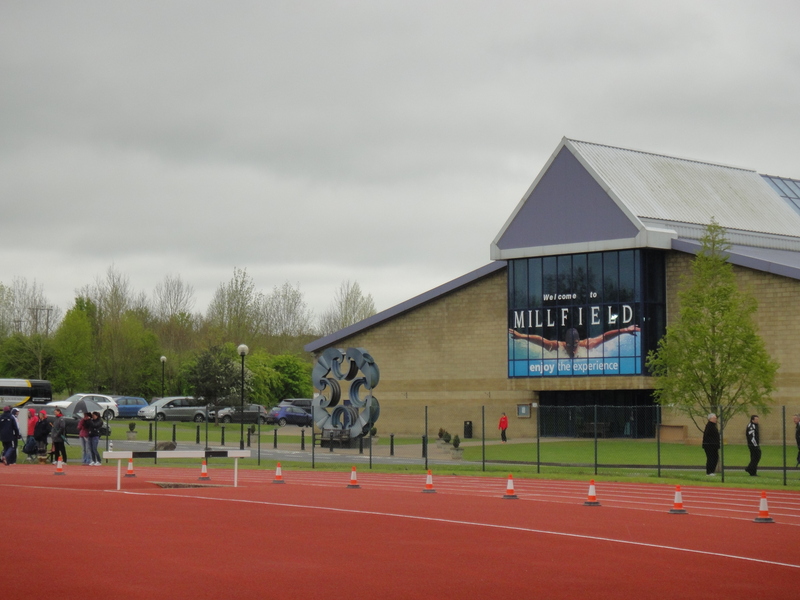 Millfield Track, enjoy the experience. Pretty much never ran that slowly in my life. Weather conditions were down right awful, being cold and very windy with spots of rain, but even that isn’t an excuse for this. Reason why I’m pretty cross with myself is that what lead to that 13.26s run was that I didn’t warm up enough in the cold and when the gun went off I strained my left hip flexor. I thought I could get away with it because I still drove out well and was thinking I’ll just cruise to the finish, but then we got called back due to a false start when we reached 60m. Unfortunately in the rerun of the race, I really felt my left hip flexor straining and pretty much headed to the first aid tent for ice straight after. It became apparent I’ve managed to hurt myself again in the long jump when my run up had to be massively shortened because I couldn’t stride out as well anymore, and then I thought maybe it’s time to throw in the towel. I knew that with this kind of start, a good score was not possible, plus with the risk of injuring myself more that would set me back further. And this is the thing that I hate about myself the most. The instinct to quit when things get tough. I was battling myself through the long jump thinking of should I or should I not. And then I remember the words from my ex-training partner, whom was advising me as I update him on my progress through the day, always finish the dec, cause you never know what happens next and each event is worth doing because there are always things you’re going to learn. I told myself, ok doesn’t matter, do the best with what I can right now, that’s all I can ask from myself. And sure enough, things started turning around. I finally got the correct 12 stride run up rhythm to the board in long jump (couldn’t really take off because of my hips though), hit out a decent enough shot on the last attempt (10m through warm up n first throw, fouled the second), high jump I cleared 1.6m easily in warm-up (thought today would be my 1.75m day, but I was in the low pool n had to wait a long long time before my opening height, the cold then got to me) and finally for the 400m I made the decision to run conservatively, but it is the first time I actually had a solid race plan that I executed following David Hughes’ (GB international 400m hurdler) advice. Yes the times and the distances were embarrassing, but as always I realised just by sticking around you learn a lot about yourself. I know I shouldn’t be this harsh on myself because I’ve only just come off my foot injury and started sprinting last week, but it’s hard not too because I’ve put in so much work and it’s frustrating to have once again nothing tangible to show for it. Time to man up for the weather and finish the race. Bring on day 2.
now things are looking up. « On LA and such.